Evidence should be provided to the judges that your nomination fulfils this brief. A statement (maximum 500 words) stating why your nomination should win this award. Evidence that demonstrates reduced numbers of complaints. Evidence that the nominated hire company adheres to the HAE EHA Code of Conduct. Evidence of effective training programmes that outline the benefits to the business, employees and customers. Evidence of relevant certifications and ISOs (dates and certification numbers) etc. SafeHire Corrective Action Plans are in place and a summary of positive impact/actions being undertaken, as a result of the SafeHire Audit. A Positive Impact Statement (maximum 500 words) outlining the positive impact and actions being undertaken and how the business is benefiting from SafeHire. Point of sale materials (catalogue, web URL, sales literature, etc.). 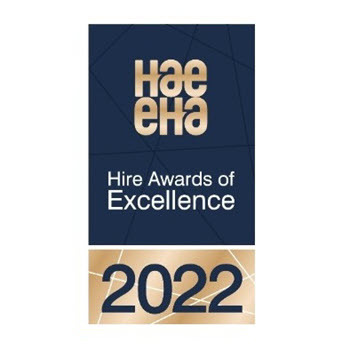 The entry deadline for the Hire Awards of Excellence has now passed and we wish all those shortlisted the very best of luck. To view the finalists click here.